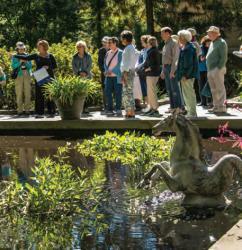 We invite you to plan your group visit to Winterthur Museum! Enjoy a unique blend of history and year-round beauty at our world-class museum, garden, and former du Pont estate. Whether your group of 15 people or more is composed of adults, seniors, or students, you can all enjoy the benefits of discounted admission, guided tours and special dining options, and much more! There is so much to see and do at Winterthur. View our upcoming events and programs here. Thank you for considering a visit to Winterthur. We look forward to welcoming your group to the estate in the near future!